The Saskatchewan city of North Battleford shut down its water intake plant Friday because of a major pipeline oil spill. Stewart Schafer, the city's director of operations, said an oil slick was detected downstream from the city on the North Saskatchewan River. "This morning they saw the sheen downstream from us," Schafer said Friday. "Husky reported to water security that they ... saw a sheen and so everything gets shut right down. "How much, how big, I couldn't tell you." 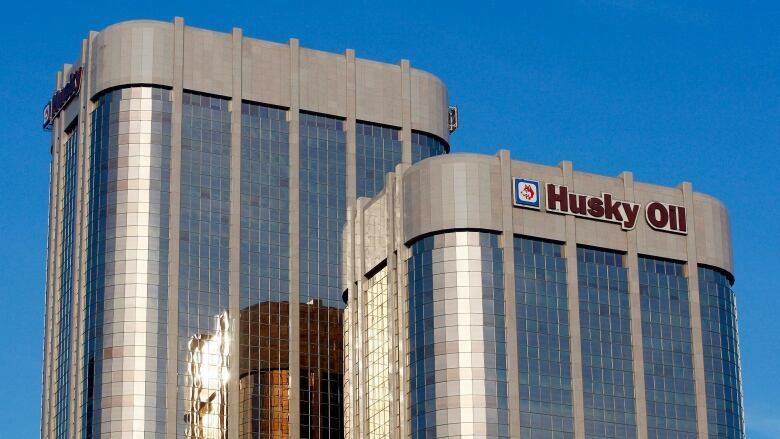 ​Husky Energy has said between 200,000 and 250,000 litres of crude oil and other material leaked into the river on Thursday from its pipeline near Maidstone, Sask. Schafer said the city has a backup supply of water in its reservoirs and water tower. It also has a ground-water treatment plant. "We have about three days and then we have to start up the other plant. By that time we are hoping that whatever contaminants hit the river are flushed down." The reservoirs and water tower had already been filled to capacity as a precautionary measure. North Battleford Mayor Ian Hamilton was asking residents to slow the flow from their taps to help ensure an adequate supply. Husky was trying to contain the spill using booms across the river, about 40 kilometres upstream from North Battleford. Chief operationing officer Rob Peabody said some of the spilled oil was on land and was being recovered. "What we do know is the leak was not under the river, as far as we can see," he told a conference call Friday morning. "The leak was kind of in a location near the river." The pipeline runs from Husky's heavy oil operations to its facilities in Lloydminster and carries oil mixed with a lighter hydrocarbon, called a diluent, that's added to ease the flow. Ralph Bock of the Environment Ministry said Thursday the Water Security Agency would take samples from the river past the boom to check for any hydrocarbons. Wes Kotyk of the department's environmental protection branch said the spill, which he said was equivalent to two rail cars, was of a "higher magnitude" than Saskatchewan is used to. "This is a rare event. We don't have incidents of this magnitude very often," Kotyk told reporters Friday morning, adding it has been a number of years since there's been an oil spill into water. Kotyk said fish and wildlife staff were developing a plan in case wildlife is affected. Peabody said it could be several weeks before a cause for the spill is known. He didn't know the age of the pipeline, but said it would have been regularly inspected under Husky's management plan. Saskatchewan Premier Brad Wall said no one wants to see an oil spill occur, but the latest leak doesn't change his support for pipelines. "The facts remain that if we're not moving by a pipeline, it's going to move ... (by rail). We know that rail is actually more susceptible to spills and spills are often more intense," Wall said from Whitehorse, Yukon, where he was attending a premiers meeting. Wall also said moving oil by rail also takes a greater toll on the environment by creating more greenhouse gas emissions. Husky president Asim Ghosh was asked about any potential negative public reaction to pipeline spills. "To be honest with you, I distinguish between a media reaction and a public reaction," he said. "But as far as we are concerned, we just focus on getting on with the job, you know. If we've got a pipeline spill, we address the pipeline spill. "We ensure we've got procedures in place and we ensure we make the procedures even more robust from each learning experience."